RaisingExplorers.net gives you the run down of the top 5 things to do in Kuching city itself. These are all within the city itself. 1. Relax by the riverside - Shady pedestrian pathways, overhung by trees, and decorated with flowerbeds, become fairyland at night, the colourful lights reflected in the river below. 2. Check out Kuching’s Cat Statues - It’s coincidence that in Malay ‘kucing’ means ‘cat’, there are three main cat statues around town. 3. Take a stroll through Chinatown - Kuching has an old Chinatown, centred around Jalan Carpenter, and a new Chinatown, which is a busy commercial area, along Jalan Padungan, which is worth a visit for its markets. 4. Take a river cruise - Whether you get on board the tiny, putting sampans that ferry people to and fro across the river, take a fast boat out to the mangroves downriver, or do one of the many touristy sunset cruises on offer, it’s worthwhile to get out on the water. 5. Kuching’s museums - covering all things natural, historical, artistic, anthropological and ethnological. 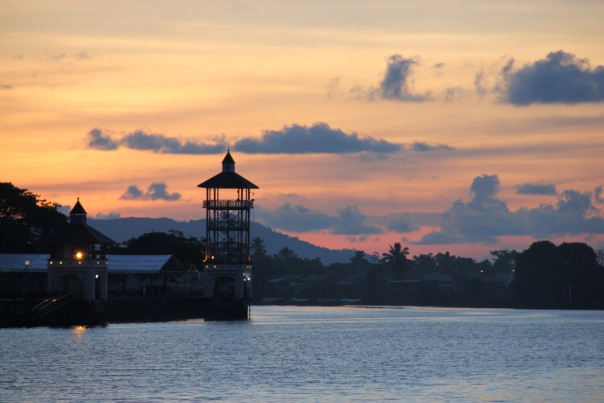 The Kuching Waterfront with Mt.Serapi in the distance. Read and view the complete interesting article and photos at Raising Explorers. Sweet list, done them all and I think I can add on more things to do in Kuching. I hope to visit again soon.